FAN FAVORITE at each year’s Colloquium is the breakout session on organ improvisation, entitled “Minding the Gap.” The class is led by the incomparable David Hughes, who is adept not only at improvising himself, but also in helping other organists to improve their approach. As in previous years, Friday’s session began with David laying out a general framework for how to conceive of an improvisation. 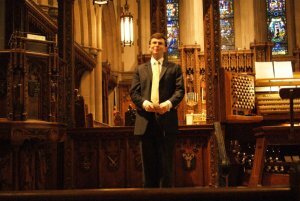 He then took volunteers to sit at the console and provide an improvisation based on the introit or offertory chant of the day to fill a certain length of time. After some critique, the volunteers received another chance or two, sometimes with an added assignment. For example, in addition to a required length of forty-five seconds, the organist might be required to modulate to a certain key or develop a certain motif. In one case, the volunteer was limited to using only two chords for his improvisation! Another observation that I was very glad to hear David make is this: when considering how to “mind the gap” with improvisation, one ought not to forget the need for silence. In other words, when we think of the periods after the introit, offertory, and communion chants, they should not be considered simply vacuums to be filled. Occasionally, plain silence will be what is best for a particular moment in a particular liturgy, and sacred musicians need to be comfortable with that.